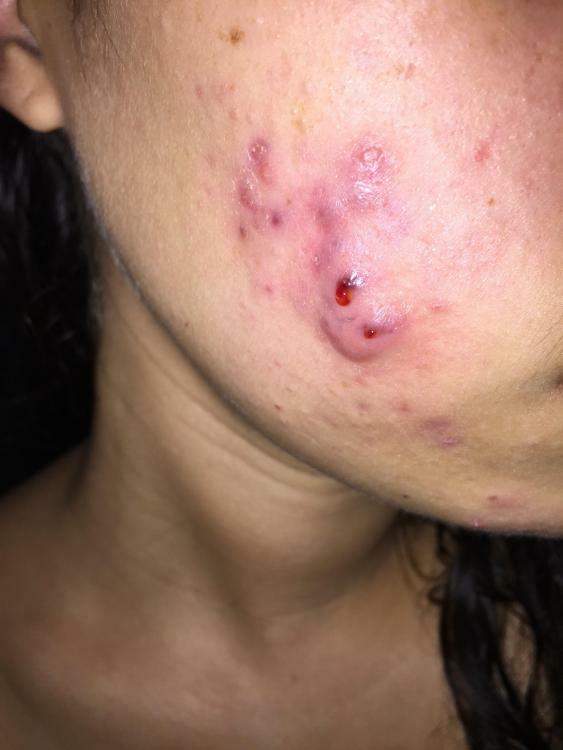 So for a bit of background: Developed acne after turning 22. I would say it's always been mild to moderate (think it's hormonal due to the fact that I'm a woman and noticed it would be much worse in stressful times and on cheeks/chin). Had to go on oral steroid for 8 weeks. Bam. 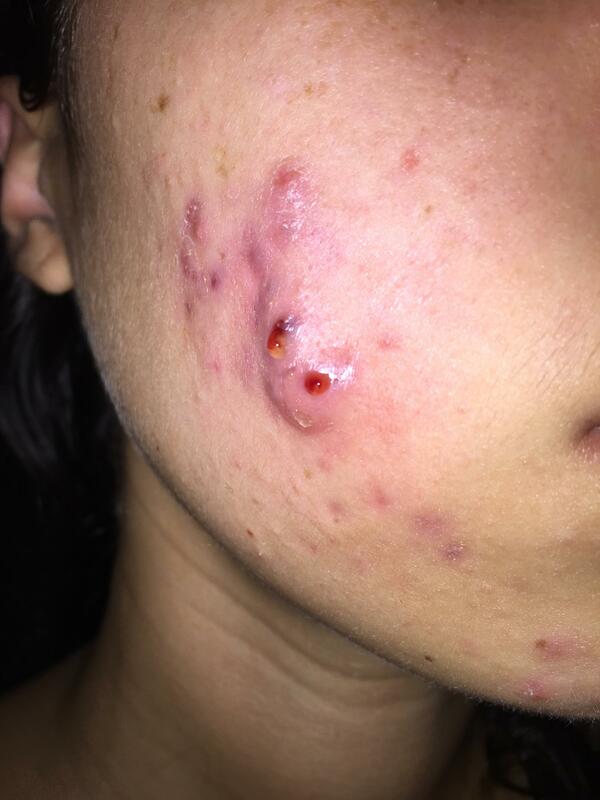 Right after the steroid got huge cystic pimples on one cheek/ in a cluster. Looked like normal cysts so just thought they would heal up. Fast forward two months later (two injections later) there is still a spot that keeps swelling up and is filled with mostly blood with some pus. I initially waited a month to see if they would clear up and when they didn't I had them injected. Went away but came back three days later. Had another injection soon after that; same thing happened. i will attach pictures. Please if anyone knows more about how to make these go away I AM BEGGING FOR HELP! this is after I tried lancing them for the third time they just ooze but still remain cystic underneath (but there is a bubble of ooze on top of that makes sense???) Also, hard to tell but where I lanced I them, prior to doing so, I could see a purple spot under the skin where there was trapped blood and a ugh so gross I just want it gone!!! i hope by this point that cyst is less visible. But anyways, cystic acne sufferer here. First of all, it seems like it is a regular cyst. So there is nothing to worry about in regards to it being like an infection or smthg. Um, I wouldn't advice you to pick on cysts for a couple of reasons. First of all that is because they cause bad scarring. And secondly because they are deep underneath the skin, and by squeezing you just force the content deeper inside the skin what can cause further expansion of the cyst. I know that it is so tempting to get rid of it, so if you just can't..I would advice you to wait until there is a clear head and ask professionals to extract it. thanks for the reply! I agree it's a cyst and I have cystic acne here and there but my main concern about this one is it has been over 2 months now and it won't go away it just keeps filling up with fluid and pus and blood and stays there in the same spot! I've never had a cyst like this before, I don't know if I'm doing a good job of explaining what it's like. The reason behind it not going away, is that you do not extract it properly. Just imagine a cyst in your skin. It is a ball of pus deep inside your skin under many follicles. When you squeeze it, it is similar to squeezing out tooth paste from a tube by pressing in the middle, some goes away another goes deeper inside. The problem of you popping it is that you don't get rid of the root. So the pus just fills up again, and can even spread out if the pus would fill nearby skin pores. The reason behind you having blood, is that your body is actually fighting the cyst by sending white blood cells to the cyst. So technically your cyst must go away by itself, but it can just take a long while. i actuallt had a cyst which lasted more than a year. It was very small after about two weeks from not touching it at all. But just think about it, I had it for more than a year. At last i got annoyed with it, and popped it with needle. The blood was almost black. I know it is gross, but think that blood was there for like an year. i am not a doc, so my info is very subjective. I am just talking from self experience and my own researches. I am just here to help, and it would be amazing know if i helped you atleast a bit.